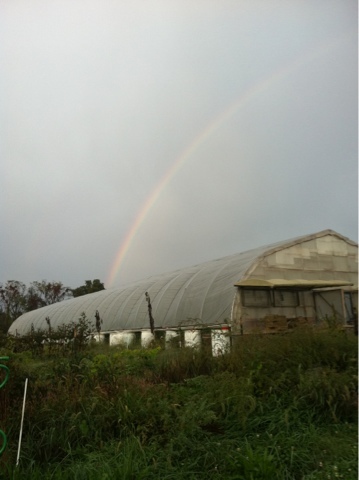 A hoop house. We think everyone who lives where weather gets cold, cloudy, rainy: anywhere a person can get the winter time blues, should have a layer of clear stuff between them and the elements. In our case it is a layer of plastic but a small space made of old windows will also do. In the dead of winter: dreary, long stretches of darkness, bone chilling cold, wind that takes your breath a hoop house is a respite. 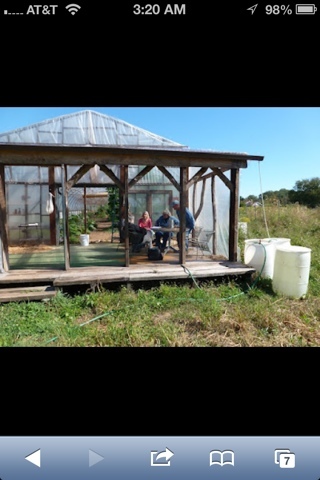 When the sun shines and the temperature is 17 outside, or maybe 34, turn down the heat in your drafty house and head to the hoop house. Sunny, quiet. If you have timed it right, food for the picking and eating. And finally warm. As we enter the season when our furnace must run again we know that we will be out here, basking in the sun, safe from the wind. So will the vegetables. And the man cave? Might need a new name, as it is sunny and warm. Perfect spot for an induction cooktop and a pot of something tasty, grown on farm, simmering and ready to eat at the farmers dinner time, as the sun sets. Makes wintertime tolerable.